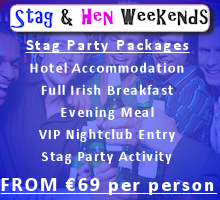 Dublin Hotel Guide, Rates and Availability, Hotelscombined Best Rates Guaranteed. “Gardiner Street is now recognised the world over as a premiere accommodation hub that is within 5 minutes’ walk of Dublin’s major attractions and yet offers clean comfortable rooms and a very personal service that is at least 30% cheaper than other accommodation in Dublin. Tourists want to spend their money on themselves and their families not on over-priced accommodation that is overpriced simply because of its location”. In 2013 there was a 7 per cent rise in visitor numbers for the island of Ireland, the best since the global economic crisis began. To capitalise on this growth and the predicted growth for 2014 (ERSI predicting 2.7% growth in domestic economy) it is essential that each accommodation vendor in Dublin takes full advantage of premium events that will maximise both occupancy and revenue, good rate management will ensure that the low season (2014-2015) will be easier to manage. Some eight million visitors came to Ireland in 2013 generating €3.64 billion in revenue. Some 6.8 million people visited the Republic, while 1.7 million visitors visited the North. Some 500,000 people visited both parts of the country. The figures have been bouyed by a record number of visitors from North American, Germany, France and Spain along with Australia and New Zealand. However, the British market remains substantially down on its peak in 2007, despite numbers being up by 7 per cent this year. It can be reasonably anticipated that UK numbers will rise as the UK is now officially out of recession. The Wild Atlantic Way: a “rugged”, “unspoiled” touring route from the Inishowen Peninsula to Kinsale, being promoted as “the road trip of a lifetime”. Ireland walks on the wild side with ambitious visitor targets, Gardiner Street Dublin has daily tours departing for all parts of Ireland’s wonderful land and sea-scapes guests can stay in Gardiner Street, enjoy a day trip and then return to Gardiner Street where they can drink in Ned Keenan’s Traditional Irish Bar or dine in Le Bon Crubeen. 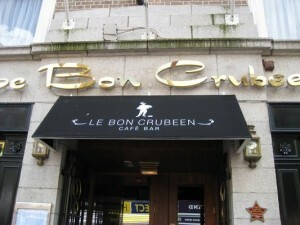 Le Bon Crubeen Winner in 2010 and short-listed as finalist in 2012 of the Irish Restaurant Awards’ Best Casual Dining Restaurant Dublin and winner of Best Value Restaurant Dublin in The Dubliner Top 100 restaurants 2012. 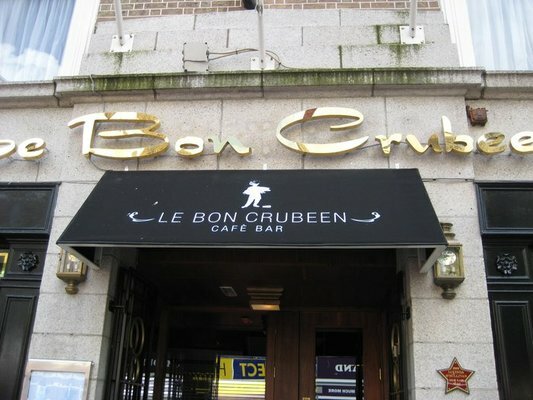 Le Bon Crubeen’s brasserie menu delivers a consistently great value dining experience all week long, sourcing produce and ingredients from the very finest Irish suppliers delivering quality and value for money. Their menus include vegetarian, Coeliac/Gluten free and healthy low calorie options. The number and length of foreign holidays taken by Irish people fell by 2 per cent in the first six months in the year compared with the same period last year and spent €47m more on foreign holidays in the first half of the year, this trend is likely to continue and it is essential that we again promote ‘Staycation’ packages in Dublin, with a particular emphasis on families. Two thirds of respondents to Fáilte Ireland’s Tourism Barometer reported an increase in visitor volumes in 2013. Sentiment in the tourism sector is at its highest level since the financial crisis hit Ireland. The United States has proved to be the biggest engine of growth with Ireland attracting a million US visitors for the first time. The Navy-Notre Dame game, which attracted 50,000 visitors to Ireland in September, was the biggest single draw last year. US visitor numbers were boosted by an increase of 26 per cent in the number of airline seats between the US and Ireland for the peak summer season. Tourism Ireland chief executive Niall Gibbons said The Gathering had “exceeded all our expectations” though it will be the New Year before figures become clearer. Bouyed by an improving world economy, Tourism Ireland, which markets the island of Ireland, believes that Ireland can achieve an average of 8.9 million visitors per year by 2016. Next year will see new flights from San Francisco, Toronto, mainland Europe and Great Britain with Ryanair adding nine new routes from April while also increasing the frequency on eight new routes. In addition there will be new Irish Ferries sailings from Holyhead and Cherbourg while LD Lines will launch a sailing from St Nazaire linking with Gijón in northern Spain to Rosslare. Mr Gibbons said the best prospect for growth in tourism numbers will come from North America and continental Europe, as visitors from those regions tend to stay longer and spend more money. British visitors tend only to stay an average of four and a half days. He revealed that the value for money ranking for Ireland from North American and continental visitors is the best it has been for 10 years. This is led by the hotel sector, with Irish hotels being rated the third cheapest in Europe. Gardiner Street Dublin Accommodation Co-Operative can enjoy greater occupancy numbers by continue to explain to guests and potential guests that Accommodation in Gardiner Street is at least 30% cheaper when compared with similar accommodation in Temple Bar, yet Temple Bar is only a 5 minute walk away. To replace The Gathering, the focus on promotion will be on promoting the Wild Atlantic Way, a 250 kilometre route from the Inishowen Peninsula in Donegal to Kinsale in Co Cork. The Limerick City of Culture, the ’Grande Partenza’ of the Giro d’Italia cycling race and the Croke Park classic between the University of Central Florida and Penn State will be the focus for foreign visitors next year. 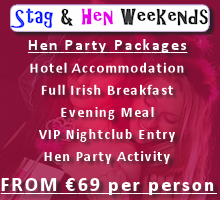 dublinhotelguide. Simple theme. Powered by Blogger.